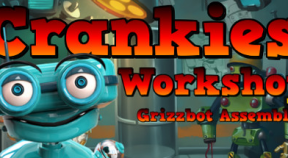 Crankies Workshop is a true or false question game with a colorful and friendly atmosphere. Crankie needs help assembling his new order of Grizzbot's and he needs you to answer the knowledge machines questions to keep it assembling the robots. He will show you the ropes and then set you loose on all 30 levels consisting of 10 questions per level. Each question you answer is a stage in the robots assembly and has a dollar value based on the speed you answer correctly. The overall value of each of the 30 completed robots(levels) is tracked and assigned a rating of 1,2,3 by Crankie so you can see yourself progress and try and beat previous scores.